Opera Software released a new beta version of the company's mobile browser for Android today that includes support for browser proxy / VPN functionality. Opera is rolling out the feature to users of the beta version on Android currently; means, you may not see it yet even if you run the latest version of the beta browser. Tap on the Opera-icon and select Settings. If you see a VPN listing under Browser near the top it is available. 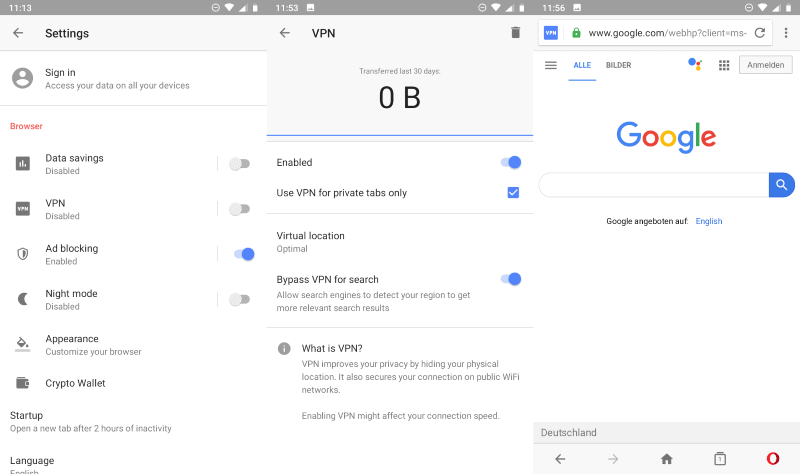 Just toggle VPN to enable it the mobile browser to test and use the proxy connection. Long-tap on the VPN listing there to display additional options. The VPN is enabled for private tabs only by default; uncheck the option in the VPN settings to enable it for all tabs. You may also switch the virtual location to force the browser to connect through servers in Europe, America, or Asia instead of letting Opera decide. Last but not least, it is possible to activate the VPN for searches as well. Doing so improves privacy but may deliver less relevant search results as the search engine may provide results for another country based on the server you are connected to. Opera for Android indicates that a VPN is used with an icon in the browser's address bar. Tap on the icon to display the transferred data of the last 30 days and change the connection location right then and there. The browser proxy has no time or data transfer limit, and Opera Software promises that it is a strict no-log service. Moreover, our VPN is a no-log service, which means that we will not collect any information that travels through the network servers. A quick test revealed that the speed is good enough for regular browsing sessions. Note that your mileage may vary based on your location and the server locations you connect to. Opera Software introduced similar support in the company's desktop browser in 2016. The desktop VPN, which is still available, works similarly in many regards. Opera users should not confuse the integration in the mobile Opera browser with Opera VPN, a standalone application for Android released in 2016. Opera killed the application in 2018, however. The integrated proxy is available free or charge, does not restrict bandwidth, and Opera Software promises that it is not logging anything. That's a good deal for users who want to improve privacy by hiding their device's IP address. The main downside of the solution is that it is limited to the Opera mobile browser, another that the solution is limited to three broad regions with no option to connect to certain countries. Now You: Do you use a proxy or VPN on your mobile devices? I have (on android) and they seem to fight with the OS quite a bit but it’s been a while, so maybe the two play better now. Opera’s a dubious browser anyway; they should decide if this “feature” is a proxy IP or VPN since they are different beasts. Browser based VPN’s are a bad idea, they should be standalone apps that can clamp everything, browsers have far too many paths in and out. I agree. My take: VPN has better marketing potential than proxy, and that is why it is called VPN by Opera Software. I almost never use my phone for the internet ( perhaps 2 times over the past year and then only while waiting for my wife to finish shopping.) Having said that, I most certainly would never use Opera now that it has been taken over by a Chinese company. A little history: Many years ago I was a high ranking executive for an American company 51% owned by a Chinese company and spent at least 25% of my time keeping them out of legal/court problems. No sooner did I leave the company then they had multiple lawsuits all of which they lost which ultimately destroyed the company. I learned first hand that while I could trust some of them individually, never trust them collectively. As a result, once Opera was bought out, it has been totally removed from all of my devices. So what does this have to do specifically with Opera? I strongly suspect that what ever now goes through Opera’s VPN (be it desktop or Android) somehow it’s being “monitored” despite claims to the contrary. . On the very rare occasion I use my phone for the internet it’s Firefox Focus. So which is it ? VPN or proxy ? On desktop Opera, it is supposed to be a proxy, despite the name. And what’s the difference ? Given Opera’s current owners, how is the VPN routed? Via Chinese servers? Thanks but no thanks. Opera, like 99% of Android browsers are useless, because they don’t have proper adblocking and popup blocking. The only one that has proper blocking is Firefox, because you can install uBlock Origin and Poper Blocker and enable all filters and it makes your browser practically immune to each of these. Firefox is very slow in loading pages and unless you install a User Agent extension that you can change it to appear as Chrome on Android, Google Search will look outdated to you. Other than that, I don’t see how VPN is beneficial on a browser that’s so vulnerable due to it’s poor adblocking and non-existent popup blocking. The mobile opera browser has 10 trackers built in according to exodus-privacy, and that implies alot of services are running. For a chromium-based mobile browser, I switched to bromite as it has the iridium and un-googled patches applied along with other interesting goodies .